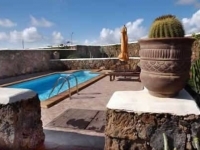 Villa to rent in Guime, Costa Teguise, Lanzarote Canary Islands. Two bedrooms Heated Private pool House cleaning and change of towels twice a week Bedlinen is changes one per week. Kitchen Fully equipped kitchen with washing machine, microwave, vitroceramic hotplate.